The world’s only truly integrated set of airport operational solutions; the Chroma Airport Suite® delivers a common technology platform that establishes a commitment to airport-wide collaboration and integration. It enables operators to establish and monitor service levels to drive an increase in performance across the airport. 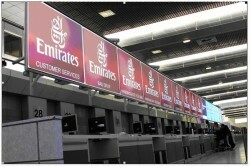 The Chroma Airport Suite facilitates Airport-wide Collaboration via an integrated set of products that include ACDB, AODB, FIDS, RMS, CDM, Demand Forecasting, in-depth Business Intelligence and Billing solutions that is helping customers including Dubai Airports, London Heathrow, Oslo and Manchester Airport Group deliver the Next Generation Airport, today. Delivering innovations such as ChromaACDB, BluFi and integrated CDM; the world’s most ambitious airport operators deserve the Chroma Airport Suite, the world’s most progressive airport operating suite. ChromaACDB puts the passenger process at the heart of airport operations; delivering real-time data and enabling truly collaborative decision making via a best of breed sensory network that includes the world’s first augmented Bluetooth & WiFi passenger tracking solution. ChromaAODB, alongside ChromaACDB, is the core module within the Chroma Airport Suite®; storing, managing and disseminating data relative to traditional operational activities around the airport for both airside and terminal operations, enhancing end-to-end stakeholder collaboration. ChromaPredict is a proven demand forecasting tool that utilises data from multiple sources including ChromaAODB, historical & future flight schedules and ChromaACDB to create a highlight accurate picture of passenger and baggage flows within each day of airport operation. ChromaFIDS is a new generation of FIDS that goes beyond simple check-in and boarding information. With multi-modal capabilities alongside advertising, branding and mobile information delivery, ChromaFIDS is a primary source of information across the airport campus and beyond. ChromaRMS is an end-to-end solution for the effective planning and management of all operational resources, providing airports, airlines and handling agents with the latest tools and techniques to support dynamic changes in passenger numbers, policies, procedures and tightening airport security requirements. ChromaBilling is a fully rule-based, automated system that is flexible to all types of airport operation and billing profiles. Increasing speed of data collation improving cashflow, ChromaBilling can highlight aircraft with outstanding payments and automatically apply incentive schemes. ChromaCDM is a fully Eurocontrol compliant Collaborative Decision Making tool that is integrated in to the existing ChromaAODB providing a single vision of all aircraft operations available to all key stakeholders in the operation. ChromaBI delivers historical, operational and forward looking business reporting to stakeholders as and when they need it; highlighting continuing operational trends around all key elements of the airport, leveraging the inherent deep operational data available to operators to make significant improvements to their processes.